The MSE Society Facebook Group is Active! 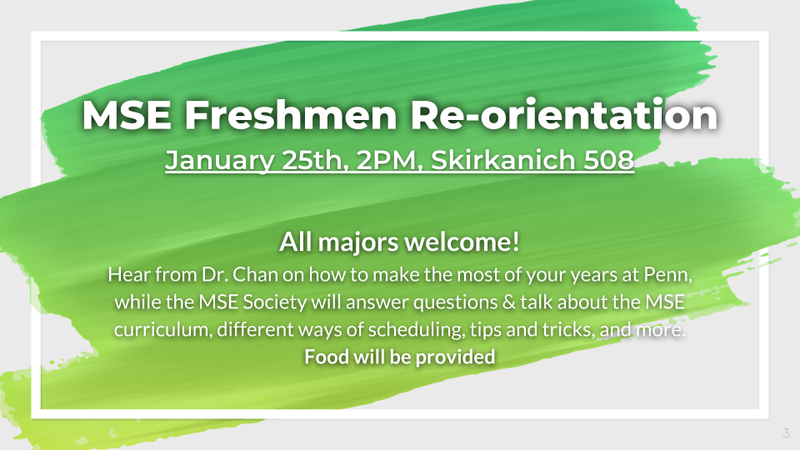 MSE Freshmen Re-orientation 2019: Come join us to learn more about the MSE curriculum and scheduling, get tips from upperclassmen, have your questions answered, and hear from Dr. Chan about getting the most out of MSE. All freshmen regardless of major are welcome. Food will be provided. Below is the calendar that links to all events hosted by groups recognized by the Engineering Student Activity Council. MSE Society events will be listed here, as well as on our events page!